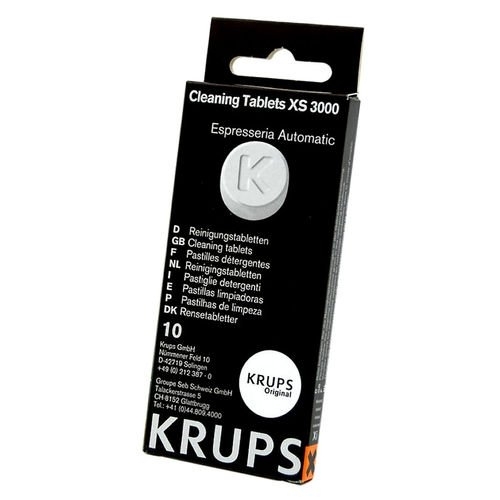 The Krups XS3000 espresso machine cleaning tablets are designed to be used during the cleaning cycle of the Krups Fully Automatic espresso machines. Using the cleaning tablets on a regular basis will ensure increased longevity for your espresso machine as well as improved coffee flavor. Espresso machine cleaning tablets (set of 10) #XS3000. Not for use with Orchestro model 889. EA8245 EA8250 EA8255 EA8260 XP7200 XP7200J4 XP7220 XP7220J4 XP7225 XP7225J4 XP7230 XP7245 XP7260 XP9000.